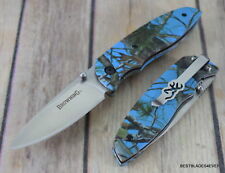 Browning Camo Folding pocket knife. Excellent quality knife with sharp blade. Blade Edge & Type: Plain, drop point blade. Knife weight: 3.5oz (100gms). Excellent quality knife with very sharp blade. Note: This knife is manual only, not the spring assisted opening. Model: Browning -338 Blade material: 440. Type: knife. Blade length: 7CM / 2.76". Blade thickness: 0.23CM / 0.09". Blade width: 1.8CM / 0.7" (widest point). Handle material: Aluminum Steel Natural White Shadow Wood. This Distinctive Knife Also Includes a Sheath! 3 1/2" stainless drop point blade with dual thumb studs and titanium finish. Dura-Touch Armor, Mossy Oak Break-Up Infinity camo handles with titanium finish bolster and pocket clip. Stainless scissors fold out of handle. 3.5" closed. 2.5" satin finish 7Cr17MoV stainless drop point blade. Camo aluminum handle. Thumb stud. Pocket clip. Blue Vista camo handles. Bone handle knives are made with cow bone. We Combine orders! 3.5" closed. 2.5" satin finish 7Cr17MoV stainless drop point blade. Camo aluminum handle. Thumb stud. Pocket clip. Tan Vista camo handles. Bone handle knives are made with cow bone. We Combine orders! 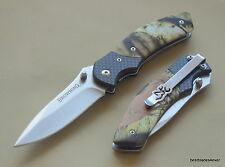 Browning Mossy Oak Linerlock Knife BR276 4 1/2" closed. Black finish stainless b. Black finish stainless blade with dual thumb studs. Mossy Oak Treestand camo finish aluminum handles with black trim. MPN: 3220054. New 4 1/2" closed linerlock. 3 1/2" dark stonewash finish 8Cr13MoV stainless drop point guthook blade with thumb stud and double cut saw blade. Mossy Oak Camo aluminum handles. Dark stonewash finish stainless bolster. You can expect our service to be friendly and professional. So we wish for you to only to have a positive experience. Can't find the answer you're looking for?. Why Buy From Us. - Any problem with an Item must be reported within warranty period. You can expect our service to be friendly and professional. Can't find the answer you're looking for?. So we wish for you to only to have a positive experience. Why Buy From Us. - Any problem with an Item must be reported within warranty period. Browning Knives 4 1/2" closed. Black finish stainless blade with dual thumb stud. Black finish stainless blade with dual thumb studs. Mossy Oak Treestand camo finish aluminum handles with black trim. Browning Black Ice Storm Linerlock Folding Knife - Free Shipping! Black Ice Storm Linerlock. Browning's Ice Storm Folding Knife is easy to carry and is always ready for lightweight jobs. Anodized aluminum handle with a stainless steel blade. Thumb studs make it easy to open. New Browning New. Misc Safety Gear. We Provide Free Local Pick Up on all orders. Mueller Scopes. Orders must be Prepaid before Pickup. Food Storage. Barska Scopes. Rifle Parts. New Browning 4 3/4" closed. 3 1/2" stainless drop point blade with dual thumb studs and titanium finish. Dura-Touch Armor, Mossy Oak Break-Up Infinity camo handles with titanium finish bolster and pocket clip. Browning Knives 4 3/4" closed. 3 1/2" stainless drop point blade with dual thumb studs and titanium finish. Dura-Touch Armor, Mossy Oak Break-Up Infinity camo handles with titanium finish bolster and pocket clip. New Browning New 4 1/2" closed linerlock. 3 1/2" dark stonewash finish 8Cr13MoV stainless drop point guthook blade with thumb stud and double cut saw blade. Mossy Oak Camo aluminum handles. Dark stonewash finish stainless bolster. Type: Linerlock; Closed: 3"; Blade: 2" l Stainless l Standard Edge l Satin Finish; Handle: Black l Aluminum; Other Info: Thumb Stud(s) l Pocket Clip l Thumb Ridge. Light features 2 white LEDs and 2 green LEDs. New 4 1/2" closed linerlock. 3 1/2" dark stonewash finish 8Cr13MoV stainless drop point guthook blade with thumb stud and double cut saw blade. Mossy Oak Camo aluminum handles. Dark stonewash finish stainless bolster.